NMIMS NPAT 2018 (बारहवीं के बाद कार्यक्रम के लिए एनएमआईएमएस राष्ट्रीय परीक्षा): National Test For Programs After Twelfth (NPAT) is an entrance exam for taking new admissions into the B.tech courses at the Mumbai and Shirpur campus, there are limited seats for the students. NPAT UG will be for 840 seats into the various streams of the B.tech courses. All eligible candidates can apply for the NMIMS NPAT Application Form 2018 of the exam. This exam will be conducted by the NMIMS’s Mukesh Patel School of Technology Management & Engineering. The NPAT UG 2018 will be conducted in the month of May. Before filling the application form of this exam all aspirants need to know all information of the NPAT UG Exam 2018. Students can get here all information about the exam related following topics- NMIMS NPAT Registrations 2018, application fees of the exam, Eligibility criteria of the exam, exam syllabus and pattern of exam, important date of the exam, sample paper of the exam, previous year exam papers, result of the exam, selection process of the exam and counseling process of the exam. Applicants need to go the official website of the exam. Click on the NPAT Admission Form 2018. Fill all the application form with correct data and attach all required document (scan copy of the original documents and recent photo and signature of the applicant). Recheck the application form and hit the submit key for submitting the application form. Don’t forget to pay the fees of the application form. For this exam, applicants need to pay Rs. 1800/- as fees of the application form. The candidates can pay this fee by the online mode of the payment. The applicant should be 12th pass from a recognized board of the education. The aspirant has minimum 45% and 50% aggregate in the 12th class according to the campus for which applicant want to take admission. In 12tth class Physics, Chemistry and Maths as the compulsory subjects. The candidates who have the Diploma degree that also can apply for this exam. In this exam, the questions will be asked from the English, Maths, Reasoning and General intelligence. So make a good study of the subjects. 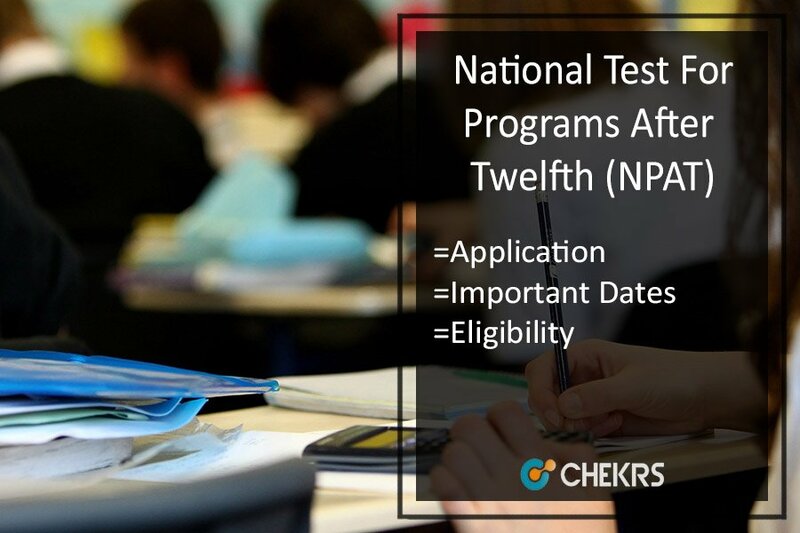 The detailed NPAT Syllabus can be checked here by accessing the article. For any wrong answer, the ¼ marks will be detected from the total marks of the each question. So fill the answer sheet carefully. The students are required to check the Sample Paper of NPAT UG 2018 to obtain good marks in the entrance exam. Candidates can see also the previous year exam papers for the practice of the exam. The sample paper and previous year paper help to make a time management and make a good speed to solve the exam paper at the exam time. The call letter of the exam will be provided before the exam on the official website. All aspirants can download the admit card from the official website they have been submitting the application form.All students need to collect the NPAT UG Exam Hall Ticket 2018 compulsory because without admit card any candidates can’t appear in the exam. The admit card is compulsory because admit card have all information of the candidate and all information of the exam. All students can see the NMIMS NPAT Result 2018 from the official web portal of the exam, who have been given the NPAT UG Exam 2018. The exam result will be announced with the rank. All students are required to fill the application form of the NPAT UG 2018 Counseling. By the counseling process, the exam board will be allotted the seats for the students to take the admission into the engineering institute. For more information NPAT UG 2018 Engineering Entrance Exam, the candidates can visit the official website of the National Test For Programs After Twelfth or they can contact us by commenting at the end of the post, we will respond you as soon as possible.